Mary Lonergan (née Dempsey) Heywood Heights and formerly, Kilsheelan. Anna McQuillan (née Healy) Powerstown Rd. Pauline Williamson (née Dillon) Elm Park. Helen Murphy (née O’Keeffe) Ardfinnan and late Kings Close, King St, Clonmel, sister of parishioner Frank O’Keeffe (ex The Crescent). Ellen Quinlivan (née Noonan) Ballingarrane North. Peggy O’Connell (née Walsh) Wilderness Grove. Vincent Walsh, Kathleen Browne, John O’Dwyer, Noel Kehoe, Jimmy McHale, Séamus McGrath. Seán Greene, Joe Joe Carey, Jack and Madge Byrne, James Carroll, Sophie Burke, Peter Molloy, Elizabeth and Maurice McGrath, Tom and Cathy Clyde, Mary Fortune, Noel Harris, Mary Anne Dalton, Nora Farrell, Patrick Farrell. Ministry to the Sick/ Nursing Homes : Mass at Melview Nursing Home. Sacrament of anointing of the sick on request. Sacrament of Holy Communion every First Friday. Sacrament of Baptism: 5pm on the First Saturday of the month in Ss. Peter & Pauls and on the third Saturday in the Resurrection. Sacrament of Marriage: Consult with one of the Priests to secure a date. Church and State Require at least 3 months notice. Pre-Marriage Course: It is strongly recommended to partake in a Pre-marriage course organised by ACCORD (Catholic Marriage Advisory Council) for bookings and information contact 052 61 24144. Resurrection: 9.30 am Week Days and 10.00am Sunday. SS Peter and Pauls offers a Bereavement Support Service that is free of charge and provided by a trained Bereavement Support Group from the Parish. Active Retirement: Next meeting will be on Thurs 6th Dec in Place4u. Final meeting for 2018. BEST WISHES to the Church of the Resurrection Choir who are leading the singing on RTE 1 TV Mass this Sunday at 11am. The Mass is the St Vincent De Paul Mass and is being broadcast live from the RTE Studios in Dublin. Local Man Kieran Stafford is National President of the SVP organization this year. St Pio Prayer Group: will meet the first Monday of each month and will meet this Monday 3rd December. Rosary and prayers at 6.30pm. Mass at 7pm for all petitions placed on the Altar. Divine Mercy: Divine Mercy Devotions will be held in Ss Peter and Pauls on Friday 7th December at 3pm. Adoration and Prayers for Healing. All welcome. Secular Franciscian Order Advent Retreat This Sunday 2nd Dec from 2pm to 5pm in the Friary Hall. Refreshments available. Coeliac Condition: Low-gluten hosts are available from the main celebrant. The hosts will be in a separate part of the ciborium. Do you need help? SVP can offer support when you need it .Talk to us in confidence. A little help at the right time can make a difference 61 23878. Sunday 9th December at 8pm. Featuring: The Clonmel Concert Band, Derek Ryan, The Gaudeamus Choir and Soloists. Tickets available at Marians Bookshop, O’Connell St., and the Parish Shop. Students will be at all Masses this weekend to promote the Pope John Paul II Award and raise funds towards our Parish Services TV project, in which we hope to have the service available in the New Year – broadcasting live Masses and services around the world. This weekend is the last weekend we can sell the poinsettias as we have to place the order on Monday. Many thanks to all who have contributed so far and given donations in the envelopes appeal. Next Friday, 7th December is the First Friday of the month, a day when we bring Holy Communion to the sick and housebound of our parish. Contact one of the priests or ring the Parish Shop 61 22138 if you or someone you know needs a call. Please note: Fr Michael will be making his First Friday calls on the Holy Day Saturday 8th December. Please note the 7.30pm Mass on Saturday 8th December is the Vigil Mass for the 2nd Sunday of Advent. Our 6th Class students from the Sisters of Charity will be at the 7.30pm Mass and will begin the Jesse Tree story. 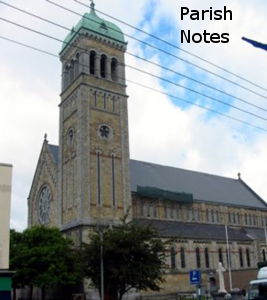 At the 11am Mass, our 2nd Class students will be continuing their First Penance and First Holy Communion preparations. Please remember all of them in your prayers at this time. If anyone could not attend the gathering in Minella last week, but would like to share their stories about Colm, please contact Fr Michael in the Parish Office with your phone / email, and we will contact you in the New Year. Thanks to all who attended and shared lovely memories of Fr Colm. Lightfever involves Eucharistic adoration, the sacrament of reconciliation, scripture, prayer ministry, music ministry, street evangelization with a candlelit church. The next two events in Waterford will be at the Cathedral of the Most Holy Trinity on Saturday 22nd and Saturday 29th December from 1pm to 5pm.